In a class discussion, brainstorm the cultural characteristics of Australia today. Prompt students to diversify beyond sport. What about politics? Religion? Values? Attitudes? Celebrations? Where do we get our ideas about Australian culture? How are these ideas perpetuated? What has been the impact of multiculturalism on Australian culture? What differences are there between rural, regional and urban Australian culture and/or the ways these are perceived? Follow this preliminary discussion with a research task to explore the context of the play. In pairs or small groups, students are to research and provide a fact sheet for the class to reference regarding the views, values and context of the time period in which the play was written and is set. Teachers should feel free to add to this list but the following topics/texts are suggested as central to understanding the context of the play. Brilliant Creatures, aired by SBS in 2014 and available on ClickView (subscribers only), is well worth obtaining and showing. Babakiueria to watch and discuss. Introduce the concept of comedy whereby something goes wrong and ritual breaks down into farce. Weddings and wedding receptions going wrong have been a rich seam for recent film-makers to explore, from Muriel’s Wedding (1994) to The Wedding Singer (1998), My Big Fat Greek Wedding (2002) and The Wedding Ringer (2015). Visit the Internet Movie Database to view trailers and synopses. For homework, ask students to view and compare two trailers for comedic effects. They should write an analysis discussing how the rituals around weddings make for good comedy. The distinction between Modernism and Postmodernism is a fine one. For an excellent discussion of the differences between the two, teachers should read Peter Barry’s Beginning Theory: An Introduction to Literary and Cultural Theory (MUP, 2009). A good quote to give students from this text is: ‘Modernism is the name given to the movement that dominated the arts and culture of the first half of the twentieth century. Modernism was that earthquake in the arts that brought down much of the structure of pre-twentieth century practice in music, painting, literature and architecture.’ Barry goes on to distinguish between Modernism and Postmodernism largely through the mood of the work: where Modernism is serious and gloomy (e.g. Eliot), Postmodernist work is playful and ironic (e.g. Carey), and so on. By this definition, Hibberd fits more neatly into a Postmodernist category, but the Introduction of the Currency Press edition (2000) identifies him as Modernist, inheriting the tradition of Bakhtin, Brecht and Beckett, all Modernist theorists or playwrights. Provide students with a synopsis of the ideas of Mikhail Bakhtin, especially his Theory of Carnivale; Brecht’s ideas about audience, “breaking the fourth wall” and non-realistic theatre. View the trailer for Patrick Stewart and Ian McKellen Waiting for Godot as a short introduction to these theatrical conventions. Discuss ways in which non-realistic dramatic conventions are evident and how this represents an “earthquake” in the traditional dramatic form. In what ways can Dimboola be identified as a Modernist work? What influences were at work on Hibberd when he wrote the play? Why was Dimboola such a popular play to perform? Why does it still resonate with audiences? What does it mean to say “Laughter is a defence”? Do you agree? Explain your answer. After reading the play, but before deep analysis, have students identify with one of the four groups of the play. Divide the room into four corners: each of the two families, the uninvited guests or Leonardo Radish. Alternatively, is there a gender divide? Ask students to move to the appropriate side/corner. Each group represents either a clan or a culture clash. Ask representatives from the resulting groups to explain their choices. Follow up with some journal writing – 300 words on the topic: “With whom is the student most sympathetic and why?”. An interesting counter argument might be to discuss whom they find most unsympathetic and why. In his Introduction, McGillick asserts that “Hibberd’s work, then as now, is simultaneously a critique and a comic celebration of Australia.” For homework, have students write in response to this, encouraging a developed piece of at least 300 words. Does Dimboola both critique and celebrate Australia? In what ways? Have students share responses either in class discussion or on a class wiki. Cast the play and use the rest of the class as the interactive audience, if possible. Reading the play aloud will clarify character and action; a short one-act play should not take more than a lesson or two to read straight through. Students should annotate their texts as they read for central concerns/themes, character and dramatic conventions. Initially, the teacher can take an active directing role, but as quickly as possible students should take the lead with directing ideas and movement. If necessary, assign a director for each reading but ideally, in a small group, the students should be able to generate such ideas. A useful initial exercise soon after reading the play is to cast it using actors they know. Encourage students to look for Australian actors first; if they choose international actors, they must be able to justify their choice from the actor’s repertoire of roles. To extend this task, students can write thumbnail character sketches to accompany the casting choice. Ask students to write Director’s Notes for a key section of the play (the opening; the end; the arrival of Leonardo Radish; another passage of their choice). These should include ideas for costuming, set, music and lighting as well as actors’ tone/movement in order to bring out the central concerns of the play for an audience. How would they use dramatic conventions to engage an audience? As a one-act play, the shape of Dimboola is less clearly defined than more traditionally structured plays. Entrances and exits become key turning points, as does the traditional ‘shape’ of the wedding breakfast. Hibberd’s vision includes a set menu. Ask the students to graph the action of the play around the courses of the menu. There is one stage direction regarding the serving of the soup (p. 73) but no further instructions about the meal. When might the main course and dessert be served? How does the storyline reflect the expected rituals of the wedding breakfast? How are those expectations subverted? With reference to Beardwood’s Literature for Senior Students (third edition) pp. 30–43, ask students to identify the conventions of drama used by Hibberd in Dimboola. It is particularly useful to examine the use of stage directions and the various ways in which these might be interpreted by different productions. Central to this discussion should be the ways in which Hibberd subverts the traditional convention to produce a Modernist text. Since this is a comedy, Hibberd relies heavily on stereotype and comedic convention such as the clown double act to characterise the denizens of Dimboola. There is little development of character to chart; instead, jokes are set up by the audience’s expectation of ways in which such a character might behave in this role at an Australian country wedding of its time. What stereotypes are there associated with each role? Who plays what role in the play? How does the character’s use of language reflect the stereotype? How do the character’s actions fulfil the stereotype? Are there ways in which the character challenges the stereotype? How might such inversions also create comedy? It is also worth noting that Hibberd draws on the Catholic/Protestant “clan” divisions in this play, with attendant stereotypes that can also be unpacked with reference to specific characters, e.g. Florence McAdam; Father Patrick O’Shea. What do these pairs have in common with Mutton and Bayonet? What function(s) do the clowns serve in the play? How does their status as “uninvited guests” allow them to comment on the action? How and where do they provide opportunities for irony and dramatic irony? How do they use euphemism and innuendo to create humour? Students should consolidate their ideas by writing at least 300 words of analysis for homework. Hibberd gives detailed musical direction, including a BAND (“Lionel Driftwood and The Pile Drivers”) in the Character List as well as full song lyrics (p. 87). Ask students to conduct some Internet research into wedding bands and Irish folk music. Another good starting point is with the various stage productions that have clips on YouTube. Students then make their own informed music selections for these moments in the play. Note the satirical title of the band; what band names are evoked by this name? Why did Hibberd use Dimboola as the setting and title of the play? Visit Australian Geographic – Dimboola: Outback town for better, for worse as a prompt for discussion. Ask students to consider how this setting might be evoked by the staging of the play, either in terms of set and/or costumes. Hibberd is celebrated for bringing the Australian voice to the stage. Closely examine key passages for peculiarly Australian language. Ask students to identify who “sounds” most Australian in a given scene and how the language choices create this effect. The contrast is most marked when Leonardo Radish speaks at length on p. 96. In what ways does he use language that is unlike the other characters? How does his voice characterise him? How does the language work to create difference in status? In education? In who belongs and who is excluded? An extension question could be to ask students to investigate an discuss how the language could also be seen to date the play. Are there slang expressions and phrases that are no longer used? What generational differences can be identified between “Australian” English of the 1960s and of today? In groups, students choose one of the following topics to prepare for presentation to the class. Each topic needs to be fully unpacked in terms of the play’s context, the writer’s views and values expressed through characterisation and the dramatic conventions used/overturned. Students should work with at least three passages from the play (each 1–1½ pages long) to provide a detailed reading for the class. Write an original script with an Australian setting that explores another familiar ritual with comic potential e.g. Grand Final day; an Australia Day barbecue; etc. Write an insert to Dimboola or an alternative ending, remaining faithful to the language and form of the original. Recast the events of the play, for example narrate the story from the perspective of one character in the form of a short story; storyboard the play for a film version; or, write an epilogue about Reen and Morrie’s 25th Wedding Anniversary; etc. This task should be accompanied by a short reflective commentary, in which students discuss the ways in which they have used language to make a convincing relationship between their piece and Hibberd’s original. Some reflection on the process of their writing is also expected. There is a short film on Hibberd and Dimboola available from Snodger Media as part of the What I wrote series, screened on the ABC. It can occasionally be viewed on ABC iView or purchased from Snodger or Ronin Films. Watch the film with students, focusing on the general introduction to Hibberd and his life and the section on Dimboola. Discuss the presenter, Dr Tess Brady’s, reading of the play. To what extent do students agree with Brady’s reading? Students might construct a Venn diagram to compare their individual reading with Brady’s. A way to provide a resistant reading of the play is to introduce the ideas of Gender theory, if students are not already familiar with these. A good introduction can be found at the Online Writing Lab (OWL). Ask students to consider the depiction of women in the play, particularly Maureen, her mother and Aggie McAdam. In what ways are they depicted either as prizes or obstacles by the play? Given the stereotypical nature of the characterisation in general, does this way of reading the play provide grounds to criticise Hibbert or does it open up other ways to read the play? A film version of Dimboola was made in 1979, directed by John Duigan that was not well received at the box-office. A trailer to the movie can be watched and it can be purchased from Umbrella Entertainment. Prior to watching the film, have the students brainstorm the differences between a play and a film. The textbook Literature for Senior Students (third edition) by Robert Beardwood is a useful resource for this activity, especially pp. 121–122 “Film Adaptation of a Play”. Ask students to storyboard a section of the play. In the process, they should pay attention to camera angles, lighting, music and sound effects as well as tone and movement for the actors. They may revisit their casting choices from their Initial response work. What would have to change? What lines might be cut? What decisions should they make about setting? Students should draw up and fill in the table from the Beardwood textbook to keep track of their observations while viewing. Students compare and contrast their interpretations of the play with the film version through the discussion of one or two key scenes, focusing on the central question: how does the meaning change when the form changes? This can be facilitated through the use of a Venn diagram (as above). Students’ ideas can be consolidated by writing up their discussion in an essay of around 600 words for homework. An alternative film to study that was far more successful at the box-office is Muriel’s Wedding (1994), directed by P. J. Hogan. Although not directly inspired by Dimboola, there are clear lines of similarity in terms of its depiction of Australia, its use of certain stereotypes for comedic effect and its central concern with wedding rituals gone awry. While viewing the film, students should draw up and fill in the following table in order to provide grounds for comparison with the play. Students compare and contrast the film with the play in terms of setting, characterisation and central concerns. In what ways can Muriel’s Wedding be seen as inheriting some of the ideas of Dimboola? How is their reading of the play enhanced or altered by their viewing of the film? Students consolidate their ideas by writing an extended analysis of the film in comparison with the play in around 600 words. Have students read the article, “Too close to home” from The Australian and write a detailed response to the article reviewing the play from their informed perspective. To what extent do they agree that Dimboola remains an effective and robust commentary on Australian character and culture? They should aim to write 600 to 800 words. Select three passages from the play, one each from the beginning, the middle and the end. Discuss and draw links between the three to write up as an analysis of the play as a whole. The focus of this task should be on the ways in which language has been used to shape meaning. Research the play’s original context and reception. Why has Dimboola been so popular and so often performed? 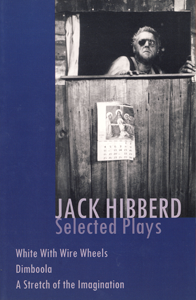 Re-visit Hibberd’s commentary on the play from the What I Wrote program; consider to what extent Hibberd achieved his stated aims with the play. Students are to complete one or the other of the two following rich tasks, but all must complete the Reflective commentary which follows. Write a speech to pitch a new production of Dimboola. This is a complex task that requires students to consider in what ways a play of the 1960s can still speak to a 21st Century audience. Students should draw on their knowledge of the play as well as staging possibilities and dramatic conventions to argue for a new production. Create a promotional website for a new production of Dimboola. This again is a form of sales pitch, examining the ways in which the play can still speak to audiences today, but it offers students a multi-modal form in which to explore dramatic conventions as well as the concerns, language and characterisation of the play. Complete a reflective commentary on one’s own processes of responding to and creating texts. Students discuss the ways in which their pieces demonstrate their understanding of the play and what they have learned about the writing process from studying Dimboola. Find a summary table for Australian Curriculum: Literature content descriptions for this unit. AMANDA SCOTT, teacher of English and Literature of over twenty years’ experience, currently works at Girton Grammar School, Bendigo where she has taught for over ten years. Whilst always teaching general English, her expertise has increasingly been in the Literature classroom, teaching VCE Literature at Years 11 and 12 since 2006. Other experience includes working at an international school in Germany for three years teaching English; working in the UK teaching English, as well as externally marking GCSE English examination papers for two years. She is a regular presenter for VATE events such as the VCE Literature Day and student revision days.